To accept a incoming Telnet connection, a PC, computer or server must enable and run Telnet Server service which is listening to TCP port 23. By default Windows (i.e. Windows Vista, Windows 7, Windows 8, Windows 8.1, Windows 10) operating system doesn’t install Telnet Server. The disabling of Telnet Server is good practice to minimize security risks. The following guide will install and enable Telnet Server in Windows if you really need it running. Telnet Server in Windows is similar to the one comes with Windows Server 2003, where it provides ASCII terminal sessions to Telnet clients, and supports two types of authentication plus four types of terminals: ANSI, VT-100, VT-52, and VTNT. Click on Start button or open the Win-X Quick Access menu in Windows 8, Windows 8.1 or Windows 10, then go to Control Panel -> Programs. 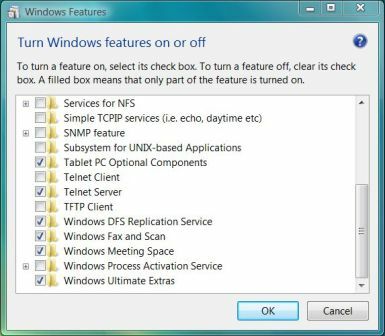 In the Windows Features dialog box, select (tick) the Telnet Server check box. Go back to Control Panel, then go to System or System and Security -> Administrator Tools. In the Startup Type drop down menu, select Automatic instead of “Disabled”. 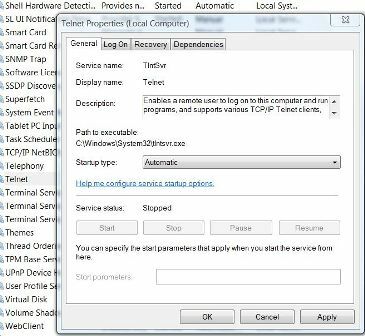 As Windows Telnet Server is ported from Telnet Server in Windows 2003, XP and 2000 (W2K), the configuration settings available and how to configure the server are pretty much similar. Generally tlntadmin command is used to administer a local or remote Telnet Server. For more command references visit Telnet Operations Guide.